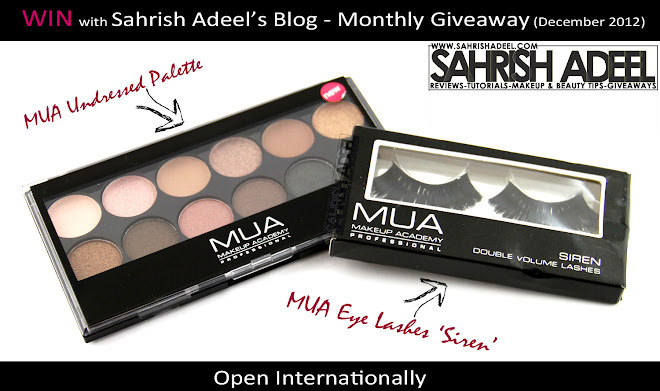 WIN MUA Makeup Goodie Bag - Monthly Giveaway (Dec 2012) - Winner Announced | Sahrish Adeel - Malaysia based Pakistani Beauty & Lifestyle Blogger! As promised, I have started my Monthly Giveaways. These giveaways will run every month from now onwards. Let's move to the rules and prizes, shall we? One random winner will receive makeup goodies by MUA, as shown in the picture above. The prize includes; one MUA Undresses Eye Shadow Palette & one MUA Eye Lashes in 'Siren'. Both of these are brand new and never been opened. There is only one must rule and that is Follow My Blog Via GFC Publicly (widget is in right side bar) and answer the first question in the widget shown below (it will ask for your GFC name and email address). For all the extra entries, I have added a widget which you will see later in this post but none of your extra entries will be counted if you are not following the blog via GFC. I will choose one random winner and will contact the winner via email. Winner will have 72 hours to claim the prize or I will have to choose a new winner. IMPORTANT: When you will enter your entry in widget below, it will give you your link that you can share. You will get 5 entries for every person that will join it from your link. Enjoy the giveaway & good luck! Thank you for your time. Don't forget to Like, Tweet or Pin this post by sharing buttons below and above this post.